These graves were discovered by the ‘Friends’ in a badly sunken state near to the catacombs in Key Hill Cemetery which, although taped up, were causing concern over public safety. 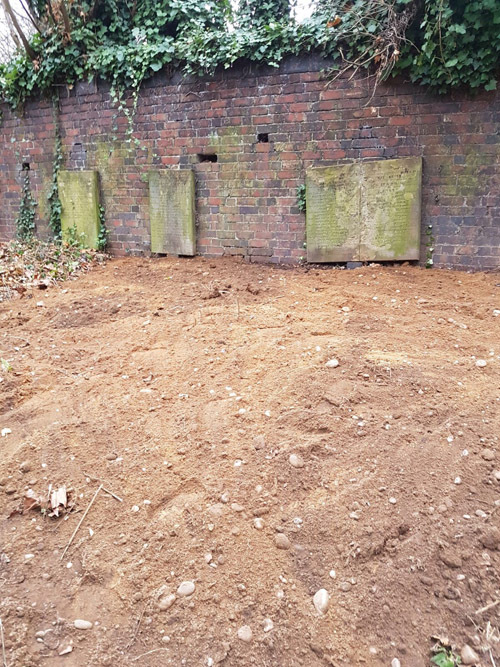 The matter was reported to Bev Nash of the Handsworth Cemetery who arranged for them to be filled in and made safe and the work has now been completed. There has been no news of when this work will begin – A couple of years ago the ‘Friends’ had a slide show with Simon Buteux from Conservation (who has now left this project) about the proposed plans, but other than this they have heard no more. In the meantime, the ‘Friends’ will carry on with their important work, with the help of Members and Volunteers. (Jacqui is busy dealing with grave enquiries and Colin and Margaret kept very busy helping to deal with enquiries and locating graves). Whilst Margaret of the ‘Friends’ was in Key Hill Cemetery recently, she spotted some men in a works van and asked if she could help them. Apparently, they were looking at the war memorial and said that is due to be cleaned in 2018. 2018 is also the 100th Anniversary since females over the age of 30 years were able to vote. This was lowered to 21 years of age in 1928. This should be a big news item in 2018. Jacqui has an article about the Rights for Women and this will be published in the ‘Friends’ own newsletter and The Hockley Flyer later in the year on the anniversary.